Betty to wear!! She's on your T shirt. 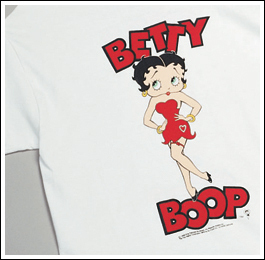 Betty is the forever Boop-Oop-A-Doop fashion queen. Classic Flapper Betty, kicking up her heels, on a white shirt. The back of the shirt shows the reverse of the front image (Betty from behind), so you see her coming and going. 100% cotton. Adult sizes M/L/XL.